Ukrainian League 2016/17. 20th round. March 5, 2017. Lutsk. Avanhard stadium. Att: 7,450. 15oC. Before the game, the players paid tribute to the memory of the miners to have died at Stepova mine in Lviv, with a minute of silence. In the encounter with the Lutsk side, Paulo Fonseca has fielded virtually the optimum line-up with the exception of one role. Viktor Kovalenko played instead of Fred, with Taison being fielded from the off. For Shakhtar goalkeeper Andriy Pyatov the meeting with Volyn has become his 200th Ukrainian League appearance for Shakhtar. The Brazilian defender Ismaily made his 50th Premier League appearance. The Orange-and-Blacks got off to a brisk start. Majority of the attacks were developed through Bernard, who frequently found himself in the spotlight early in the game. On 6 minutes, the Brazilian spectacularly beat the host defenders just to lack little luck in the closing phase. A little later, Bernard along with Ismaily created a shooting opportunity for Taison, with the ball flying just over the crossbar. In the 16th minute, Olexandr Kucher might have opened the scoring following a corner. The Shakhtar defender headed it goalwards experiencing no interference, with only a goalpost turning out to come to Volyn’s rescue. Taison fired the rebound into the back of the net only to find himself offside. A few minutes later, Ismaily threatened on goal, with the defenders backing the goalkeeper though. The Pitmen continued to keep the ball under control, taking advantage of the entire attacking width. Marlos succeeded in producing a spectacular slaloming run on 29 minutes, easily beating three Volyn players only to see his shot on goal lacking accuracy. The hosts involved nearly the whole team in defending, launching counterattacks just occasionally. After the break, the game pattern did not change. Darijo Srna produced a stunning volley on 51 minutes, with Volyn keeper showing his great reflexes by turning the ball for a corner. Shortly afterwards, Viktor Kovalenko created a chance for Gustavo Blanco Leschuk. The Argentine striker decided to lob the ball past Vitaliy Nedilko only to witness the Lutsk keeper’s immaculate performance. The goalkeeper made another save on 64 minutes. Taison, Bernard and Marlos carried out a blistering attack, which was rounded off with a close-range shot by Blanco Leschuk only to see Volyn keeper turn up in the way of the ball. Viktor Kovalenko managed to turn the overwhelming advantage into a goal in the 66th minute. Taison, being assisted by Bernard,made it past Nedilko and fed the nearing Ukrainian, who just rounded off the move with a precision shot. Shortly afterwards, the ball touched the back of the net again, with Bernard scoring from an offside position according to the linesman. 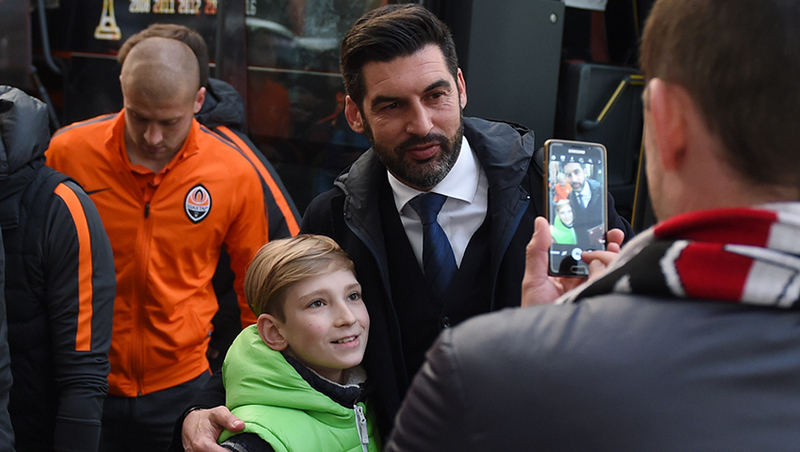 On 83 minutes, Paulo Fonseca made the first substitution: instead of the goal scorer Viktor Kovalenko appeared Maksym Malyshev. 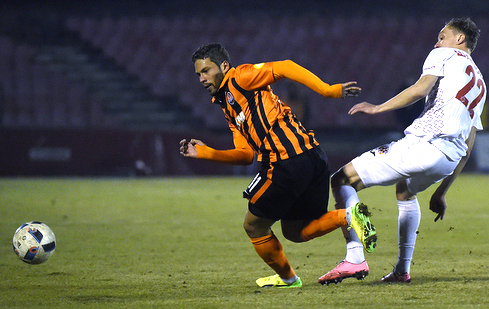 Before the final whistle, Taison and Marlos were replaced by Alan Patrick and Oleksandr Zubkov. The Brazilian’s previous appearance for Shakhtar took place on May 11, 2013. In the remaining time, the Orange-and-Blacks controlled the course of the game, bringing it to a logical victory. The Pitmen’s next match will be held on March 12. In Kharkiv, in the Premier League round 21, the Donetsk team will take on Zorya Luhansk. The game kicks off at 19:30.